The Montréal Bridge League invites any and all bridge players interested to sit on its Board of Directors to submit an application. 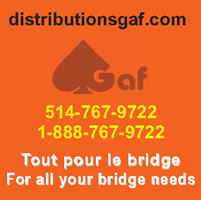 The Montréal Bridge League invites any and all bridge players who would be willing to sit as a member of its Board of Directors to make known their request. Mr. Leo Weniger, Director for District 1, is one of the 25 District Directors on the Board of Directors to attend the meeting held by the ACBL before each NABC. His report is posted on the District’s website, at the following link. Click here. Mr. Leo Weniger, Director for District 1, has published his report following the Board of Directors meeting held at the most recent NABC in Reno (Nevada). His full report can be found by clicking on the following link. Do you share our passion for bridge and wish to join our team?